On http://evasi0n.com/l.html, they share the reasoning behind the thinking and explain the story of the agreement. Preventing piracy is also extremely important to us. We are deeply sorry and embarrassed about the piracy that was seen today. All of us have spoken out vehemently against piracy in the past. We donâ€™t believe itâ€™s right for developers to not get paid for their work. In our agreement with Taig, we contractually bind them to not have piracy in their store. This was an extremely important precondition of working with them. In entering the agreement with them, we had hoped and continue to hope that our cooperation with Taig will improve the piracy situation in China. Many App Stores within China, including those run by large corporations, have many issues with pirated software. Promoting an app store that is required not to have piracy with our jailbreak, we believe, will help developers. We are very upset that despite our agreement and review by their team, piracy was found in the store. It was not acceptable and they have been strenuously working to resolve the problem in good faith, and have removed all instances of it that we have brought to their attention. We are happy that it was not overlooked by the community. Weâ€™ve been so heads down working on the code that we didnâ€™t see this. We are sorry. We will continue to monitor this issue and work to resolve it completely. 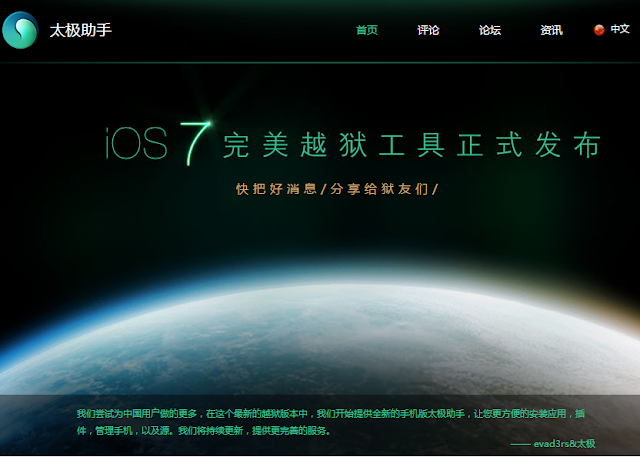 Taig will be pulled from the jailbreak if it cannot be resolved. That being said, Jay, creater of Cydia, or Saurik, has plans of releasing a full-fledged iOS 7 supported jailbreak with an updated Cydia, MobileSubstrate, and may be done soon. As of now, a jailbreak shouldn't be on an everyday device, and as far as I know, the tweaks are broken and most apps don't function or crash. For any one of my devices beside my iPod Touch, I know that a jailbreak won't be happening until the Taig malware scandal or other issues and tweaks are worked out. I will be updating the jailbreak scene as the story continues to develop.